Winterhaven PTSA will neutrally post ads and flyers for student-related camps, after-school programs, clubs, and related businesses. The listings we provide here are not an endorsement of any program, club, camp, or other business by Winterhaven School, the PTSA, its governing board or officers. The PTSA assumes no responsibility for the accuracy of the information provided by these organizations. Families should vet all activities and organizations before enrolling their children. Any questions regarding programs should be directed to the organizations listed and not to Winterhaven School or the PTSA. To have an Ad listed, please email Admin@winterhavenschool.org and Kim.Brater@winterhavenschool.org. Description: TrackTown Youth League is a series of 15 completely FREE all-comer track meets throughout Oregon open to all children ages 7-14, culminating in a championship meet at Hayward Field in Eugene. Events include the 100m, 400m, 1500m, long jump and turbo javelin. No prior track & field experience is needed! The mission of TrackTown Youth League is to provide youth from all backgrounds and income levels the opportunity to participate in track & field. Top finishers advance to a championship meet at Hayward Field at the U of O in conjunction with NCAA Outdoor Track & Field Championships! Pre-register individually for this event using the registration link below. If you are interested in bringing a group of 10 or more youth to participate, please contact us so we can assist you with a group registration. Description: Do you play games and wonder how they are created? Would you like to build your own computer programs? Come learn how at the Coding with Kids Academy! 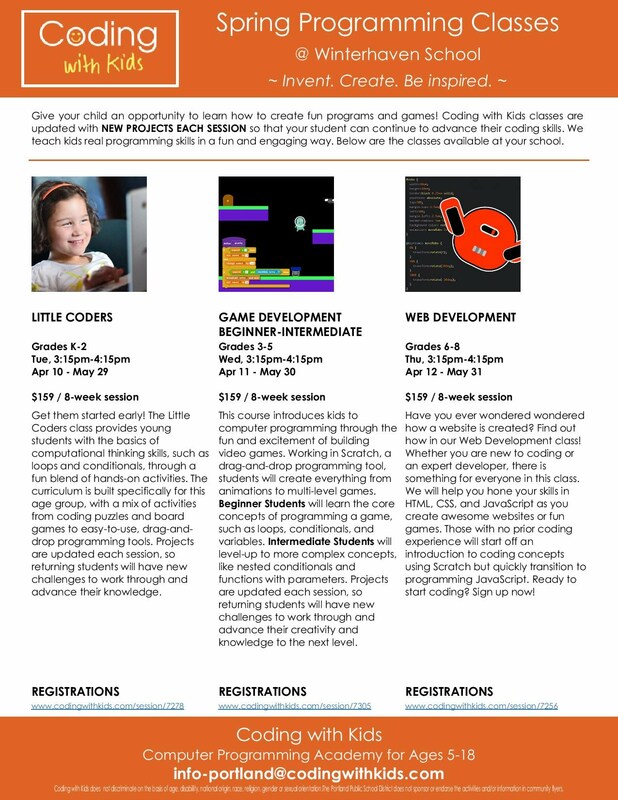 In this fun after-school class, BEGINNERS will be introduced to the core concepts of computer programming, including loops, conditionals and variables. INTERMEDIATE students will build on their previous knowledge and be introduced to more advanced concepts, such as nested conditionals and functions with parameters. Using the Scratch development environment, you will learn how to create a variety of programs, from simple animations to multi-level games. With new projects each session, you will be able to express your creativity and advance as a coder! Our progressive curriculum will allow you to move to the next level after just 1-3 sessions. Hurry, spots fill up fast! Muse Band is an After School program that teaches Brass, Woodwind, and Percussion instruments to students after school on Tuesdays. Prereigstration Discount! Sign your student up before July 15 to receive a discount. See website for details. Description: (no experience needed) M.U.S.E. (Musical Understanding thru Sound Education) offers instrumental programs in both public and private schools in the San Francisco bay area and Portland Oregon. NOTE: Advanced students sometimes stay until 5:05 p.m. to cover advanced techniques. Girl Circus is a Summer Camp for girls or girl-identified students. Description: What Happens at Girl Circus Camp? Strength and flexibility training, partner acrobatics, hooping, poi spinning, juggling, ribbon baton, snacks, and more games, elementary gymnastics, dance, teamwork, character development, friendship, and bravery. Not necessarily in that order! NW Children's Theater is a theater-arts after-school program. Description: Actor's Toolbox: The Storyteller! This Spring, students will bring classic tales & fantastical stories to life, learning how to take their favorite myths, fables, or books and transform them into live theater. This class explores the fundamentals of theater from projection and stage presence to expression and character development. Kids Like Languages is a language-teaching after-school program. Description: Students will learn Mandarin, French, or Spanish using fun and engaging activities. Math Gamers is a math-oriented after-school club. Description: Students play "Making Pathways: Addition and Subtraction"© to help them with algebraic relationships.